Corner of Buffalo Rd./Rte. 33 and Westside Dr.
Office hours are Monday -Thursday 9:00 a.m.-2:00 p.m. Messages may be left at any time. 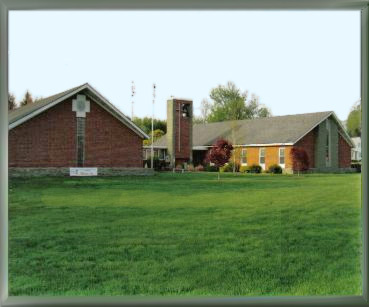 Our church is handicapped accessible with ample parking immediately behind the church. The main entry doors are located at the back, from the Parking lot. Handicapped parking spaces are close to the sidewalk. The Church has free wi-fi access. We have a Safe Sanctuaries policy in our Church. Merge onto I-90 E / New York State Thruway East toward I-290 / Albany (Portions toll). Merge onto I-490 E via exit 47 toward RT-19/Leroy/Rochester. Turn left onto NY-259 / Union St. Merge onto I-90 W / New York State Thruway West via exit 25A toward Buffalo (Portions toll). Take the RT-386 exit, exit , toward Chili Center. Turn left onto Westside Dr / CR-119.